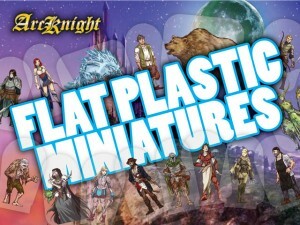 Arcknight has a Kickstarter campaign up and running for Flat Plastic Miniatures. Pretty self-explanatory in the description there. They've made their goal, so check out stretch goals and extras they'll be aiming to unlock for the next 57 days. We want to bring a new option to tabletop gaming - miniatures printed on thick clear plastic, with great double-sided art that's pre-cut and ready to use for pennies on the dollar. The Flat Plastic Miniature (FPM) is similar to a cardboard pawn or papercraft mini, except that it's produced on thick transparent plastic. They are artistically pleasing without any white edges and can be used to create a library of miniatures OR supplement the existing miniatures you already have.